The first Valkyria Chronicles is heading to Switch, SEGA announced at SEGA Fes 2018 today. In Japan, it will be released as “Valkyria Chronicles for Nintendo Switch” this fall via the eShop. The first Valkyria Chronicles on Switch will include previously-released DLC. 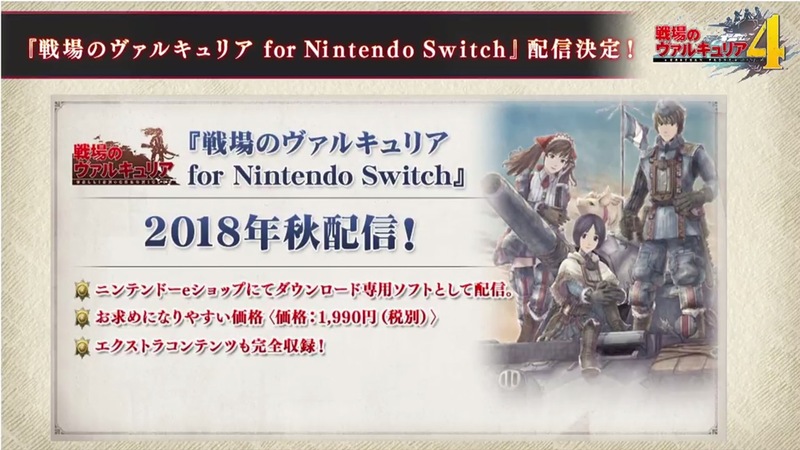 Also, those who purchase Valkyria Chronicles 4 will be able to pick up the newly-announced first title for 500 yen. Speaking of Valkyria Chronicles 4, the title will now arrive this fall in Japan as opposed to summer. The change will not have an impact on the western launch as it was already scheduled for fall in North America and Europe.